The Alhambra, a Unesco Heritage site, is Spain's most visited attraction. One has to book 3 months in advance for a ticket to the palaces or be at the gate by 8 am to line up for a last minute ticket. The pictures I took over a Christmas holiday trip in 2006 did not amount to much. I didn't have advance booking and only got into Granada by bus from Malaga after 10:00 am. I was limited to walking around looking at the palaces from the outside. The Alhambra is actually a fortress with 13 towers, not just one palace. 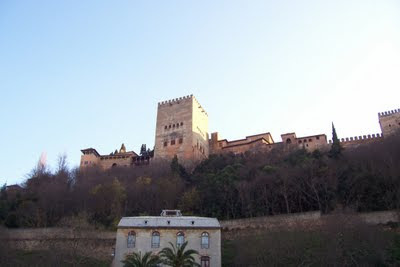 Within the fortress, are the 3 Nasrid palaces (the Nasrid was the last Moorish dynasty in Granada). 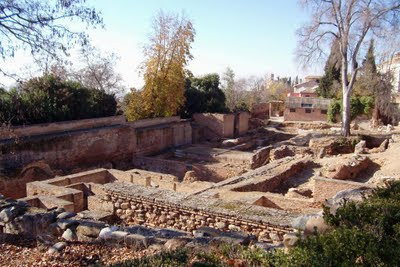 In one of these palaces is the famous Court of the Lions (Patio de Leones). The other palaces are the Palacio de Generalife (also Moorish) and the Palacio de Carlos V, built after the Spanish conquest of 1492. 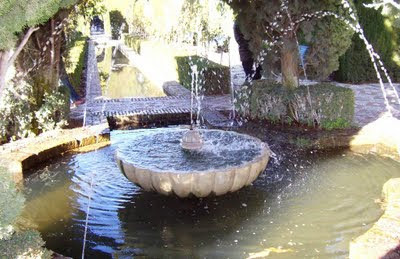 The gardens inside the fortress feature a lot of fountains like the first photo. Seeing the famous Islamic architecture and design work of the Nasrid palaces up close and personal would have been just brilliant. Next time for sure. A walking tour of the Albayzin however saved the day. On the other side of the River Darro from the Alhambra is Albayzin, another UNESCO Heritage site. The Albayzin is a well preserved Moorish town with steep and winding, narrow streets, mosques, baths and medieval houses (some even showing dates on the wall). 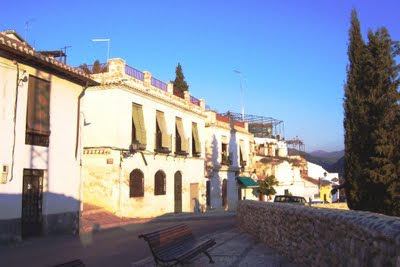 The Albayzin remains the Moorish/Jewish quarter of the city today. It definitely felt special.